The holocaust was a tragedy of inconceivable proportion. It is sickening not only that it happened, but that some of the attitudes and behaviours that gave rise to it continued long afterward, even to this day, in countries including Canada. It is an uncomfortable fact, but one that Canadians must reckon with: Canada has a history of structural and cultural violence, most blatantly manifest in racism and discrimination against many groups. This has certainly included a long and shameful tradition of antisemitism. In the 1930s, Canada accepted only some 4,000 Jewish refugees of the hundreds of thousands trying to leave Europe. In the ’30s and ’40s, rampant antisemitism included “restrictive covenants” wherein land owners refused to sell or rent to Jews. While nowhere near the scale of the Christie Pitts riots of 1933 , in 2014 police recorded at least 44 antisemitic hate crimes in Toronto alone. Clearly antisemitism is a persistent threat and one that must be addressed. For this reason it is deeply troubling when we see extremely important and powerful words like antisemitism being compromised through misuse to promote a political agenda. The Government of Ontario today debated a motion to “reject the differential treatment of Israel, including the Boycott, Divestment and Sanctions movement,” without any acknowledgement in either the motion or the debate of why the BDS movement exists or what its actual aims or methods are. Simply put, the Government of Ontario is taking the path laid out for it by lobbyists seeking to silence legitimate nonviolent protest. This detracts from, and has the potential to undermine, a much needed focus on genuine antisemitism and other forms of racism and oppression. One must ask – what exactly do our elected officials mean by antisemitism with respect to the boycott, divestment, and sanctions (BDS) movement? Politicians have suggested that BDS is antisemitic because it makes Jewish Canadians feel threatened. 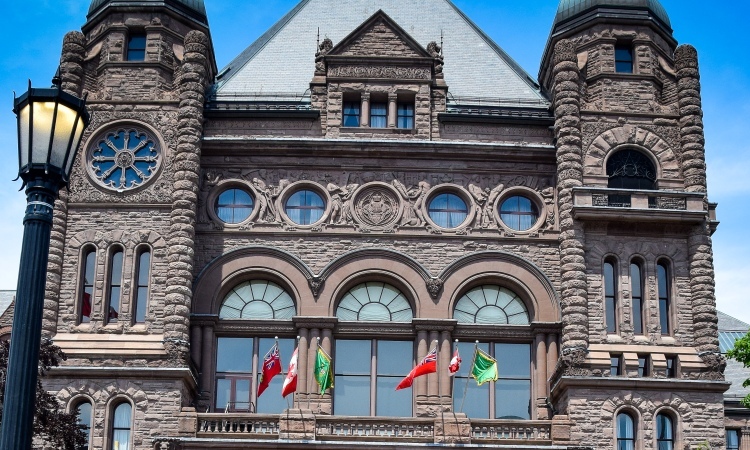 Multiple Members of the Ontario Provincial Parliament (MPPs) rose in the debate today and equated BDS with “terrorism”, stating that it makes Jewish students feel intimidated on university campuses. Physical or psychological attacks or intimidation are never appropriate and should rightly be opposed. However universities must remain places open to debate and reflection. While many people will feel deeply uncomfortable if things they believe in or hold dear are criticised, this type of discomfort is an inescapable part of a healthy democracy. The Ontario Legislative Building, where today’s debate took place. In fact, BDS is supported by many Jewish groups and individuals. It is not directed at individuals or the Jewish community anywhere. It is directed at any company (many of them not Israeli) propping up massive violations of human rights and international law committed by the government of Israel. Facing an increasingly unbearable situation and a dialogue process that has gone nowhere, in 2005 Palestinian civil society got together in the occupied West Bank to issue three clear demands. The demands are very much in keeping with Canada’s own official position: end the occupation, equal rights for all citizens of Israel, and the right of return for Palestinian refugees. If these demands were met, the boycotts would end at once. In that glorious moment Israelis and Palestinians would be able to coexist in a more balanced, just, and peaceful relationship. Instead of working in that direction, Western governments are pouring their energy into shutting down human rights supporters. If Ontario rejects BDS, what else is it proposing that Palestinians and supporters of human rights and the rule of law do? No positive options are being put forward, which signals that they are to do nothing, while the Government of Israel continues to violate international law with impunity. Have the politicians making these decisions spoken with the wide range of supporters of BDS, including Friends, who collectively support a boycott of the products of illegal Israeli settlements? 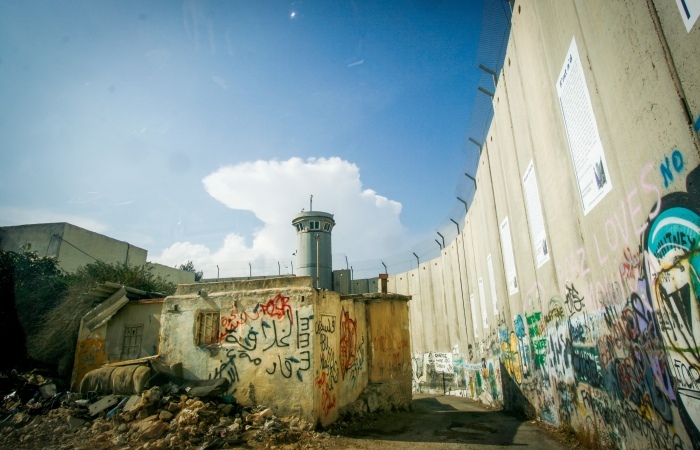 The separation wall surrounding Bethlehem in the occupied West Bank. If the same MPPs debated while standing here instead of in the Ontario Legislature Building, one wonders, would their perspectives have been at all different? We seek justice and peace for all. We acknowledge that we have much to learn and that our perspectives are never complete. We hope to learn in conversation with Israelis and Palestinians, and Jewish and Palestinian Canadians. We hope to learn in a Canada that respects its citizens’ rights and refrains from cynically attacking the very values underlying a peaceful society, while claiming to be attacking hatred. We seek a world where hatred, whether in the form of antisemitism in Toronto or the unconscionable blockade of Gaza by Israel, is overcome through nonviolence. We know that the work of challenging hatred must be done with great care, so as to promote future reconciliation. Let us care for each other, even those with whom we do not agree. We engage in BDS from care, and we do not hate the companies we boycott and refuse to invest in. We will continue to seek to engage with them and with all those who misguidedly support illegal and destructive actions of any government. We do this with care for the condition of all creation. We do this because of our ultimate goal, positive peace, peace grounded in just conditions for all. Abella, Irving and Troper, Harold. (1983). None is Too Many: Canada and the Jews of Europe 1933-1948. University of Toronto Press. Adelman, Howard and Simpson, John H. eds. (1996). Multiculturalism, Jews and Identities in Canada. The Hebrew University. Download this statement in PDF.